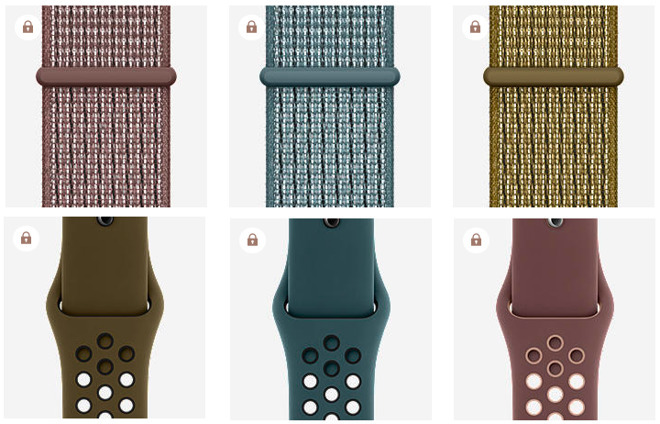 Surfacing in the Apple Watch Nike+ section of Nike's website, the new colors are Olive Flak, Smokey Mauve, and Celestial Teal. All three colors are available in both Sport Band and Sport Loop versions, as well as in both 40mm and 44mm sizes to match the current generation of Apple Watch, including standard and Nike+ versions. The trio of colors is seemingly limited only to Nike's store, with the options not appearing in other online outlets at this time, suggesting they are exclusive accessories. Furthering the exclusivity, Nike also requires customers to become members of NikePlus, the company's program connected to its apps that provides access to limited edition products, running and training programs, and other athletic-related features. While the sign-up is required to buy the specific band colors, joining NikePlus itself is free and doesn't require any additional cost. Nike is selling all three colors for $49 each for both Sport Loop and Sport Band versions, and in both available sizes. The new colors join an ever-growing roster of other bands and loops in the Apple Watch collection. On Wednesday, Apple released a (PRODUCT)RED version of the Apple Watch Sport Loop for $49, with part of the proceeds going to the Global Fund's efforts to combat HIV/AIDS.